When Hog Roast Biggar catered school secretary Carol’s retirement party over the weekend, our professional team members cooked up a storm for her fifty guests, ensuring that everyone invited enjoyed their food. While we often cook hog and spit roasts for our customers, we can provide so much more if needed too, so whether you fancy a barbecue, with gourmet sausages and pure beef burgers, or you’d like to sample our Southern Slow Roast Menu, which gives you an amazing three mains and four sides, we can wow you and your guests from start to finish. Sometimes, however, one of our hog roasts made into delicious Hog Roast Biggar pigs in buns (which you may know as hog roast rolls) is exactly what’s needed, and for Carol’s special occasion, that’s exactly what she wanted her guests to enjoy. 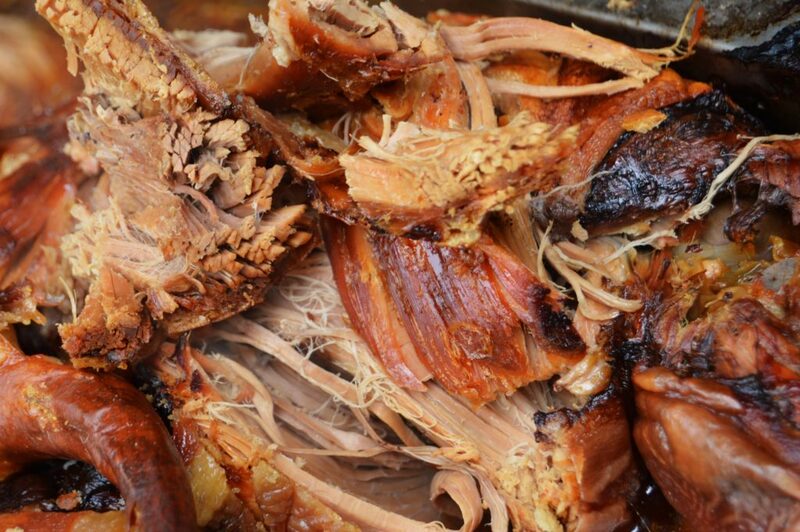 To make these succulent pieces of heaven, we prepare a hog from scratch at your venue and then cook for hours and hours, until we get tender, moist morsels of pork and crispy skin that’s turned into crackling. After a short rest, we carve away and cram pieces of the meat and crackling into soft bread rolls and wraps, add our homemade sage and onion stuffing and own-recipe apple sauce, and then they are handed over to you and your guests to devour with absolute relish – and you’re usually back for seconds or more, too! On the day of Carol’s party, our Hog Roast Biggar chef and team made their way to the venue, outside her old school, and we set up in the playground, several hours before service. After prepping the meat by scoring it in diagonal shapes, and adding water and salt, our trusty hog roast machine was turned in, we set the temperature and then let the meat sizzle away for nearly five hours. By 6pm, Carol and her guests had all arrived to the mouthwatering, meaty aromas and the fabulous sight of the hog, resting and waiting to be carved and then stuffed into the buns and wraps. Before long, the queues began and it was time for us to feed the hungry hordes. 25th Wedding Anniversary, Hog Roast in Lamington.